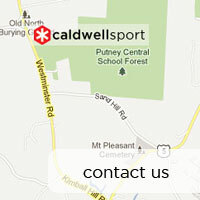 For information on specific models click here. To order skis click here. The the introduction of the REDline products at the top of the Madshus line-up, we’ve finally got a full range of products that reflect the development story that I started to tell in the last two years worth of company backstory. 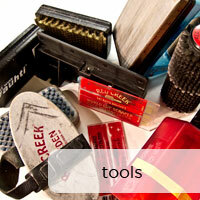 A complete desciption of the REDline skis is available here. 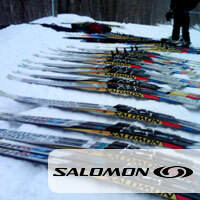 Last year when I wrote about Madshus skis I focused on material selection and control in production. All of that remains true, and I’ve left last year’s text intact below. But for this season I want to talk about design and development. 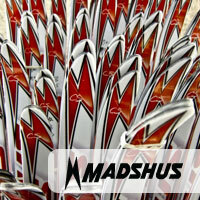 Madshus has released a new 119 model ski to relatively little fanfare, but to huge effect! While the new 119 “SC/R” (for soft conditions & regular conditions) is based upon the same concept as the 119 from last year, but is essentially an entirely new ski. What do we mean by a “new” ski? Well, one of the factors that a company can change to most fundamentally affect the performance of their skis is the thickness profile. 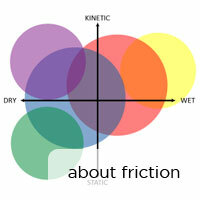 Stiffness is a cube-function of thickness, so small adjustments to the thickness of the ski can make a big difference to the stiffness of the materials. But changing the entire thickness profile of a ski can mean building a new mold which is very expensive. The new 119 ski is primarily a big adjustment to the thickness profile, and required new molds. 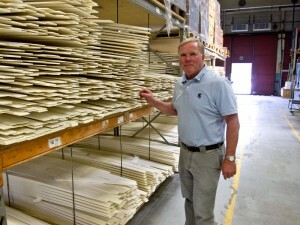 If there is one guy you want to meet when you visit Madshus it’s Gunnar Bjertnaes. He is the engineer who took Madshus from wood to composite construction, who first used black PE bases, and who owns the patent on the NIS system. 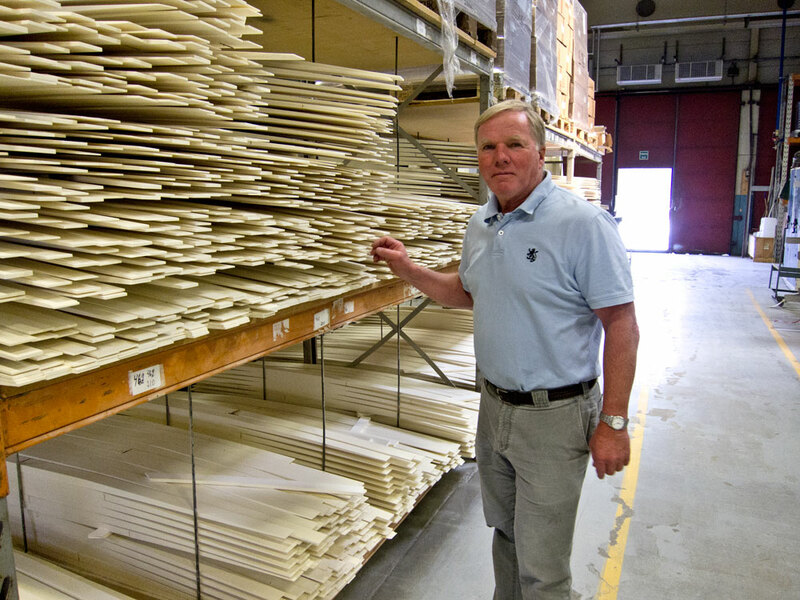 He is responsible for the construction and design of Madshus skis, and he built the factory and the process that it contains. He’s an older fellow now, and is supposed to be retiring soon. I’ve heard that every time I visited Madshus, but he’s always there. But there’s a “new guy” now. Bjorn-Ivar Austrem isn’t actually all that new to Madshus, he’s been there for a number of years already. But he has been the main engineer pushing the racing development forward in recent times, and we’re now really seeing the fruits of his labors. Bjorn Ivar bring with him a modern engineering education and great facility with software modeling. The new skis are a great example of truly modern material development, coupled with a tight-knit test group with fast and informed feedback. Hakan Nordbak, Thomas Alsgaard and Ole Einar Bjorndalen chatting between training/testing sessions in the Sognefjellhytta lobby. Oh, yes. About that feedback. All companies take feedback from their big-name athletes. 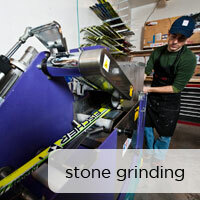 Madshus, perhaps more than any brand, integrates active skiers into the development process more than most. They work closely with a small handful of very recognizable names, including Thomas Alsgaard, Ole Einar Bjorndalen, and Odd Bjorn Hjelmeseth. These guys, and a few others, are actively involved in testing new product during prototype phase, and helping to steer the development of the designs. During the time we were in Norway this past June, Noah Hoffman met with Per Wiik, Hakan Nordback, and John Svenson to discuss the terms of an international contract (he had previously been supported by Madshus USA). The arrangement that Madshus offered him included a non-disclosure agreement, and an invitation to be part of the testing group. Perhaps this is normal operating procedure, but it was new to me. And I think it reflects on the level of involvement that Madshus has with their athletes. At a certain level, Madshus skiers are really brought into the process as partners, and this is a critical piece of the development process. It’s truly impressive to see the development team and process in action, and to see the quality of design that emerges. 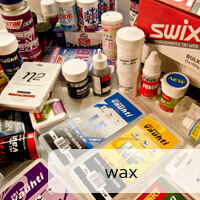 As Madshus pursues this process I think we can expect to see outstanding progress throughout the product line. I’ve been a fan of Madshus skis for over a decade, but for much of that time I felt that finding really excellent pairs was a little bit hit or miss. In the past several years I’ve invested more time in the brand, working with the Madshus racing guys in Norway and the US to develop a good fleet for Noah Hoffman. During this time Madshus has made some significant changes to their skis, and I think the direction they have taken, combined with the control they have of their materials, has put them on a really good path. With last year’s introduction of the new skate models with the updated top sheet shape and profile, I feel that Madshus has an outstanding lineup of skis. More importantly, I feel that my understanding of the skis has developed to the point where it is no longer a hit or miss proposition to find excellent materials. 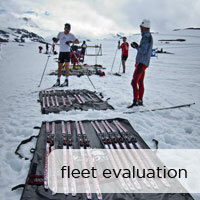 The skis Noah has gotten in the past year have been outstanding, with a very high adoption rate into the race fleet. 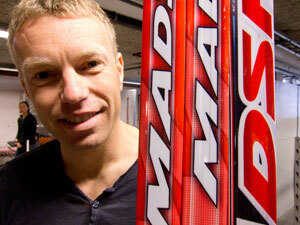 Madshus skis are, perhaps, the most high-tech skis being made in terms of materials and design. In large part this is because they’re made in Norway, in the most expensive labor market in the world. To be financially viable it’s necessary to build tremendous efficiencies into the production of the skis, and part of this efficiency depends on the on-time delivery of very consistent materials. 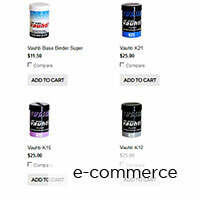 Madshus has taken a commodities-based approach to materials selection. This means that they utilize materials that are manufactured to very tight specifications, and available anytime with a near perfect consistency of production. This allows the factory to run with a light inventory of materials. The use of these materials is facilitated by careful engineering. None of the Madshus materials have meaningful structural integrity on their own. Only once they’re glued up and formed in the press do the qualities of the materials combine to create a single, dynamic object. A great deal of attention is paid to balancing tensile and compressive forces on the bottom and the top of the ski to ensure a uniform and controllable load response profile. The construction techniques that Madshus has developed in order to be competitive in the marketplace have enabled them to create just about anything they can imagine, with near-perfect reproducibility. I believe that they have really narrowed their sights on what they want to build in the past two years, and that the yield of excellent skis from their production is unprecedented. 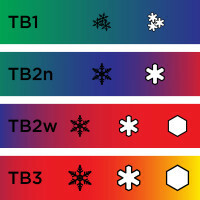 The one concession associated with the materials and design of the Madshus skis is a high susceptibility to thermal damage. 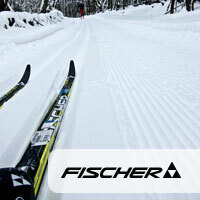 All of the materials involved in the production of the skis are thermoplastic, and the core does not absorb heat. This means that heat from the iron can accumulate very quickly in the laminations between the base and the core, resulting in the materials rising up and deforming the base. This past year Madshus improved the thermal tolerance of the skis immensely, and we saw only one pair of this year’s inventory with serious thermal damage. The improvement was mostly from tightening the material tolerances for the density of the core, which allow them to mill the edges of the core closer to a zero-dimension near the tip and tail of the ski. This eliminates voids in the lay-up where resin can accumulate, and hold heat from the iron. It is important to use a an iron hot enough to allow wax to flow easily, and then to heat the wax in a single continuous pass, allowing it to cool to room temperature before reheating. 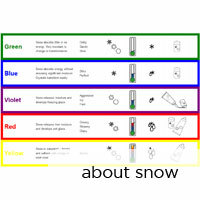 This will ensure that there is never any thermal deformation of the ski. There is no issue with putting Madshus skis in a heatbox.